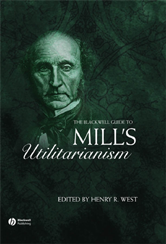 The Blackwell Guide to Mill's Utilitarianism volume is an ideal commentary for students on Mill's classic essay. Contains the complete text of Utilitarianism and related essays. Essays cover the background to Mill's classic essay, analyses of the arguments, and contemporary debates within the utilitarian tradition. Also includes a case study demonstrating the application of utilitarian theory to military or non-violent responses to terrorism. Each contribution is an original essay written by a specialist at the cutting edge of philosophical scholarship.